There is a lot of good trading software out there and I have not independently tested every one of them to accurately compare them. However, I have tried a bunch of them so I can give you some of my thoughts and some things to look for. In many cases the trading software you pick will have a lot to do with the broker you pick so we will look at them together. Some brokers are inexpensive and some are not, but the inexpensive ones often have limited support for things like market data. Some brokers limit your data more than others. A stock or options trader who executes 4 (or more) day trades in 5 business days in a margin account with an account size of less than $25,000. Some brokers, like TDAmeritrade, will enforce a more restrictive limit of 3-in-5 and will apply it to a cash (non-margin) account. Some brokers may require a beginning balance of $30,000. Regulates margin (borrowing from your broker). Normal margin is 50% of the liquidation value of your account. Margin may not be applied to penny stocks (OTCBB) by your broker. Portfolio margin can give you up to six times the buying power, particularly for selling naked options. Many brokers do not offer portfolio margin and those that do will place restrictions on experience and account size (typically for accounts over $100,000). Cash accounts that re-use uncleared money are in violation of the free-riding rule or may have done a liquidation violation which may cause his account to be restricted for 90 days if it occurs 3 times in a year. Stocks take 3 days to clear and options take 1 day to clear. This rule might not be applied by some brokers on an option trade that is simply a rollout to a later expiration. Interactive Brokers ("IB") is a very large broker and their commissions are among the most inexpensive but they will throttle your free data with a "pacing violation" if you request too much data. This limit is not that hard to reach for active traders of stocks who have a robust list of favorite go-to stocks to find good trading setups or for those who subscribe to multiple stock pick sites that give long lists of potential setups. 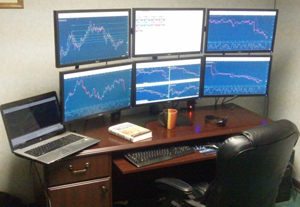 IB supports several trading platforms like MultiCharts, NinjaTrader, Sierra Charts, and their own "Trader Workstation"(TWS). The TWS platform seems pretty good but lacks 3rd party support and the full breadth of features available on other platforms. IB offers portfolio margin to traders with large accounts. TDAmeritrade is a really big outfit among retail traders and investors ("retail" = you, a private person who trades/invests). They bought the company that produced the ThinkOrSwim"(TOS) platform, which was developed by Tom Sosnoff, who is a great options trader. As such, the TOS platform is outstanding for options trading. TDAmeritrade will enforce a 3-in-5 pattern day trade rule on IRAs and cash accounts. This will include rolling option positions and adjustments to option positions. Their published fee rates are too high but you can usually negotiate a lower rate if you trade a lot. They offer portfolio margin to veteran traders with accounts of at least $125,000. Portfolio Margin is a huge game changer if you trade stocks and/or options and can qualify for it. TOS is Java based but be sure it is the 64-bit version (The 32-bit version has a limit of 1.280GB of memory); after that it chokes. The 64-bit version will allow much higher memory usage. The TOS platform is good and attractive looking, but it has some difficulties scaling up without some fine tuning and has very limited 3rd party trading software tools support. There is no limit on data and the quality of the data is good enough for most traders. They also support the NinjaTrader platform for new customers. The TDAmeritrade cost per trade is higher than other discount brokers who cater to traders but there are no monthly fees, so if you don't trade a lot per day then they could be a cost effective solution. Don't count on getting the 100 free trades when you open a new account if you trade futures. My impression from talking to traders is that TradeStation is the gold standard among veteran private (retail) traders and is used by a few commercial traders. They have the highest level of 3rd party software support of any trading platform. Virtually any sort of special indicator or automated trading strategy is available with TradeStation. They are both a broker and a software company, but they were a software company first. Their cost of trading is very low, although some others are a bit lower. Their data is not free but is costs a lot less than it used to and is relatively monitor as long as you meet the minimum monthly trading volume, which is not too hard to do if you are moderately active in your trading. TradeStation is a great place to trade a smaller account and an IRA. They will NOT hit you with the pattern day trader rule cash account or IRA. They will allow you to roll a position further out in time even if your available buying power is very low (they will not apply a free-ride violation). They do not offer portfolio margin. Their data is excellent and there is no hard limit on the number of symbols. Their data servers are very strong such that you can download three years of one minute historcial data on one hundread symbols in under eight minutes most of the time. However, their paper trade servers are slow and less reliable. The TradeStation forums are extremely active with some truely brilliant people answering really hard questions and answering them well (most of the time). I think most TradeStation users begin somewhere else and graduate to TradeStation when they are ready to take it up to the next level. They run a pretty conservative shop with their money rules so if you don't have at least $10K for futures or $35K for stocks/options then you are not ready for TradeStation. Note that I am a registered TradeStation developer (I write applications that run on TradeStation -they don't pay me anything, I mostly use it myself or sometimes sell it). TradeStation has discounted trading costs available to people who buy from some of their partners (and then open a NEW account at TradeStation), things like education at Online Trading Academy or equipment at TradingComputers.com. 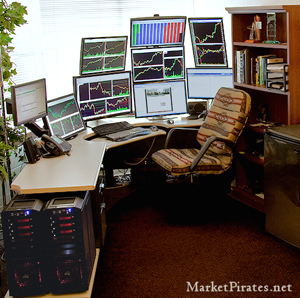 MultiCharts makes great trading software and is not closely tied to any one broker or data source. You can use a wide range of discount and deep discount brokers as well as multiple data sources (check their Website for the list). MultiCharts is highly compatible with TradeStation's EasyLanguage code and market data feed so you can launch TradeStation and then run MultiCharts to share the TradeStation data (which I do). Nearly any 3rd party add-on software for TradeStation can be run on MultiCharts (but may require a different way of licensing if it is for limited distribution). MultiCharts is a full featured trading platform with all the professional features an independent trader might need. It can be rented or bought outright (which can lower your cost in the long run). I often run multiple data feeds from different sources into it. The on-screen trading feature is the best I have seen. Like TradeStation, it has excellent trade automation features. I developed the Anaconda Exit System for several platforms but in my testing I found that the asynchronis automation feature of MultiCharts is the most reliable way to implement it. With Anaconda you place and order and Anaconda manages the exit. I find the exit to be more important than the entry as long as the entry is at least 50% winners when managed correctly. MultiCharts has a market replay feature that allows you to practice your trades in the evenings and weekend to sharpen your skills. MultiCharts is one of just a handful of platforms that are highly threaded in their programming, which can take full advantage of quad core and six core processors. The multi thread feature will help you when the market is moving fast and the single thread trading platforms choke. NinjaTrader is a very popular trading platform that is not tied to a specific broker. It is most commonly used for futures trading but can be used to trade anything. 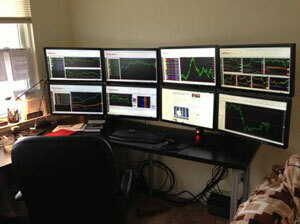 NinjaTrader originated on-screen trading and is still very popular for this feature. It has a lot of 3rd party software support but the implementation of the code and the way variables are handled is somewhat different from other platforms so NinjaTrader will rarely give you exactly the same result as another platform like TradeStation for the same formula. NinjaTraders has a market replay feature that allows you to practice your trades in the evenings and weekend to sharpen your skills. It is free for paper trading and you only need to buy it when you are ready to do on-screen trading. The market data cost makes this solution much better for futures trading where your broker will give you the data for free. Most NinjaTrader data vendors will charge too much for too little data on stocks ($65+/month for only 100 symbols). MetaStock is owned by Thompson Reuters and was one of the early trading platforms (1982) in the development of Internet trading. It is a platform that comes with it's own data plan. While not the cheapest platform it is reasonably priced as a high end platform. The data is very good and you can open a lot of symbols for markets around the world, which makes it very popular among international traders. MetaStock has reasonably good 3rd party indicator support as well as more than 150 free indicators, including 42 adaptive indicators. MetaStock is usually broker independent in that it is not connected to your broker for on-chart trading and position monitoring. You would typically have a broker interface open on the side for entering your trades. This approach was the most common way to trade for many years and still works very well for swing trading but is not ideal for day trading where on-chart trading is generally preferred. MetaTrader(MT) is the leading platform designed specifically for forex trading and is usually supplied for little or no cost by your forex broker. While there is a MetaTrader5 (MT5) version, most brokers only support MetaTrader4 (MT4) due to its great popularity and lack of compatibility with MT5. It has all the features that you would expect of a first rate trading platform. MT is frequently connected to a dealing desk where the data is manipulated to take your money. You are not trading against a real market but against a trader who's job it is to take your money (A "Bucket Shop"). MT can also be connected to a real market (Straight Through Processing or "STP"). If your broker does not use STP then you get to tell a story like this one: "I opened an account with two metatrader brokers, expecting the brokers were transparent in their dealing. I ran demo accounts versus live accounts for 6 months, and regularly found material differences between demo performance and real performance, real accounts performed poorly, whereas demo accounts performed highly profitably." Some forex brokers using MT are STP and many are legal scams to take your money. If you do a Google search "STP Forex brokers" then you can find lists of the brokers that you should consider. As I stated at the beginning of this section, there are a number of good trading platforms out there that I have not discussed, such as CQG, eSignal and Sierra Charts. I have seen most of them in action and some are very good but I have not used them enough to make an intelligent evaluation or comparison to other platforms. Scott Tafel is the founder and principle partner in Falcon Trading Systems: computers for traders. He has been a trader since 1999. Mr. Tafel spent 27 years working in the Nuclear power industry, principally as a Nuclear Reactor Operator.